The SA Branch of the Australian Institute of Geoscientists presents..
Paul Spry is Professor of Economic Geology at Iowa State University (USA) where he has been since 1983. He earned B.S. (Honours) and a M.S. 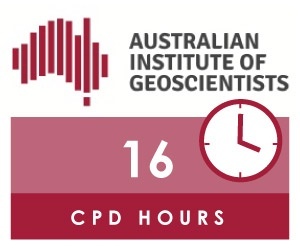 degrees in geology at the University of Adelaide and a Ph.D. in economic geology at the University of Toronto in 1984. Paul has focussed his research efforts on the effects of metamorphism on ore deposits, the geology, mineralogy, and geochemistry of epizonal and mesozonal gold-silver telluride deposits, and the mineralogy of ore deposits, in general. He has also conducted research on Mississippi Valley-type, porphyry-style Cu and Mo, high-temperature carbonate replacement Pb-Zn-Ag, and intrusion-related gold deposits. A particular emphasis of his research has been on the Broken Hill Pb-Zn-Ag deposit. Paul has supervised 30 MSc and PhD students and has published more than 100 refereed papers, book chapters and books in economic geology and mineralogy. Paul is currently on the editorial board of Economic Geology, and has served on the editorial boards of Ore Geology Reviews, Canadian Mineralogist, and Mineralogy and Petrology. He was the 2012 Thayer Lindsley Visiting Lecturer for the Society of Economic Geologists. Graham Teale has over 40 years experience as a mineral exploration, mining and research geologist. He began his career in the early 1970s as an exploration geologist and petrologist for Falconbridge (Aust) Pty Ltd in Western Australia. He has undertaken research at the University of Adelaide and was a consultant to Marathon Petroleum Australia Limited and Pan Australian Mining from 1978 to 1987. He carried out exploration and research work on the large Mt Leyshon gold project, as well as grass roots exploration and research throughout Australia and overseas. Since 1988 Graham has been working as a consultant to the mineral exploration and mining industries specifically for gold, base metal and IOCG mineralisation. He is currently carrying out research with Prof. Paul Spry of Iowa State University on the world class Broken Hill Deposit. He has worked on metamorphosed base metal mineralisation throughout Australia and in Africa, North America, India and Scandinavia. Graham has presented workshops on primary litho-geochemistry, low sulphur zinc mineralisation and IOCG mineralisation. Registrations close Wednesday 4th April, 2018. Register using the booking form below. If you encounter any issues with the registration form below, please contact bookings@aig.org.au. Lunch and morning / afternoon teas provided.